Love learning, connecting, all things education. 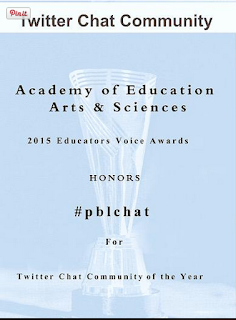 Moderator of #PBLChat, (project based learning) Online Community Manager for New Tech Network. Over the past few years I have had the opportunity to do many workshops with mostly high school students regarding crafting their "digital footprint" or "digital tattoo". One of the activities the students do in this workshop always hits a nerve with the majority of students ( and actually...it does with the teachers in the room as well). Get out your cell phone, open the app that you use the most for social sharing. Pull up your feed, showing your instas, tweets, FB posts....just show your own stream. Now take ONE minute and look through your feed....choose 3 words to describe what others might assume about you based ONLY on what you have shared. I go first, sharing my twitter stream via the projector and ask the students to choose 3 words to describe me or my interests. They typically say...education, education technology, schools, teachers, New Tech Network, project based learning or other similar words. Now...the fun begins, I ask students to share their words. After everyone who wants to shares has a chance to speak...I have them think for 30 secs about if their "three words" really represents who they are as a whole person. They generally say, not really or maybe yes, just a part of them. Then I ask them to think of 3 words they WISH were the most prominent. How can we as high school students still "be ourselves" on social media while crafting a "brand of Me"
Students always come up with great strategies for this. Which I won't share because you need to be impressed with what your OWN students come up with. This is a super simple lesson that can be a springboard to using social media as a learning tool or to get students thinking about how far reaching their online persona can be! I did not prepare my classroom & maybe you shouldn't either! Inspired by this post "Less is More? What do your classroom walls look like?" by Craig Kemp and a twitter conversation with Tim Kaegi . I thought I would share something I did many years ago with my 1st graders at the beginning of the year. It was way back in 1992 when I was teaching at Nora Elementary in Indianapolis. It was my first teaching position, but my 3rd year at that school. 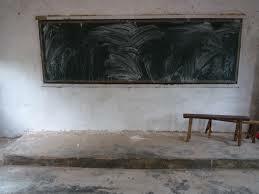 I loved teaching there. I had great leadership and wonderful colleagues. A few of us in the building had given up the basal readers, and were exploring having "inquiry based" classrooms. We had strong administrative support, it was a great place to be a beginning teacher. I was really exploring deeply giving those 1st graders ownership of their own learning and was studying Reggio Emilia due to my years at the Butler University College of Education and the now current Dean of Education, Ena Shelley . So....I did not prepare my classroom! When my students arrived, it looked pretty much how the custodians left it. You should have seen their faces! They didn't know what to do, they were already "experts" at what school looked like at 6 and 7 years old! I greeted them, said hi and....watched...it wasn't too long before one of the students "took charge". She said, " When are we having a class meeting?" I asked "Do you guys want a class meeting?" They said yes and immediately say down in a group in front of the easel and white board. "Why isn't our room ready?" "Where should we put our backpacks?" "Where are the bathroom passes?" "Where is the jobs list?" So I told them this was OUR learning space and that we were going to create it together. They made a list of what they thought we needed and they divided themselves up and got to work. They arranged tables, chairs, made bulletin boards ( WAY better than anything I had ever done and it was THEIR work), set up reading areas, the calendar, stations, made job charts....I'm sure I'm forgetting things, but if they thought it was needed, they created it! We had a wonderful year. For the rest of my years at Nora I began the year with the furniture shoved in a corner and nothing on the walls and we created our learning space from scratch, together. So I KNOW “they” say we aren’t motivated by awards , but I have to admit….I sometimes am ! When I woke up and checked my Twitter Feed the day after the Educator’s Voice Awards were announced and saw all of the congratulatory tweets, I did a little happy dance! 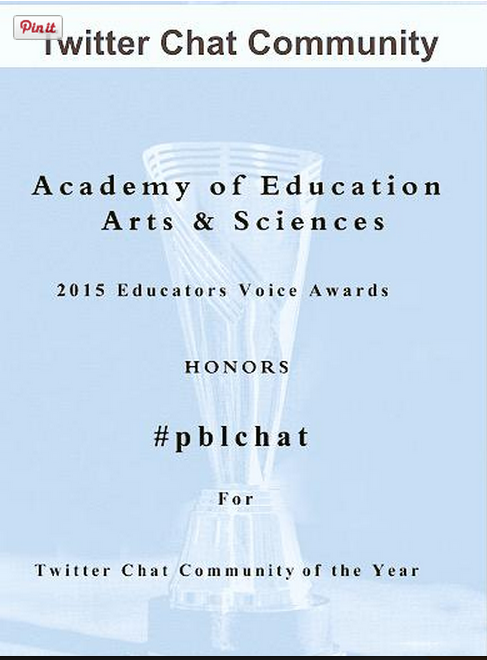 #PBLChat began over 4 years ago as a way to create community and conversation around project-based learning. I gathered together several colleagues who really valued our Twitter PLNs put our heads together and come up with this chat. I have had the pleasure of meeting and connecting with so many people via this chat and my knowledge base has grown tremendously because of them. I’ve gotten to meet some of my “edu-crushes” both virtually and in person. When I first began diving deeply into PBL it was as a Technology Coordinator for Rochester Community Schools as they began their partnership with New Tech Network. I dog-eared this book by Suzie Boss and Jane Krauss to death. Now there is even a 2nd edition of it available to you. Imagine my delight when I held a PBLchat at ISTE in person with Suzie & Jane after they had joined in on our chat several times. That is one of my favorite personal “twitter wins” as a direct result of this chat. · When teachers tweet out sharing they implemented something learned during the chat. · When teachers who are out their doing great PBL work on their own without the support of a local network find validation in this chat. After chatting almost every single Tuesday night for 4 years, I will admit, it can give a girl a bit of burn out! A big shout out to Jeff Spencer, Principal at Washington Discovery Academy in Plymouth Indiana for taking one of the Tuesdays each month and adding a little elementary flavor ! Some of my favorite chats have been our “Mash-Up Chats” where we partner with folks like SteelCase, Project Lead the Way and StemPremiere . We love adding new voices and ideas to our chat and want to focus on that this year. If you are interested in partnering with us for a chat…add your information here and we will be in touch! A big big thank you to the Education Academy of Arts and Sciences and the Bammy Awards for drawing attention to “All That is Good in Education” ! 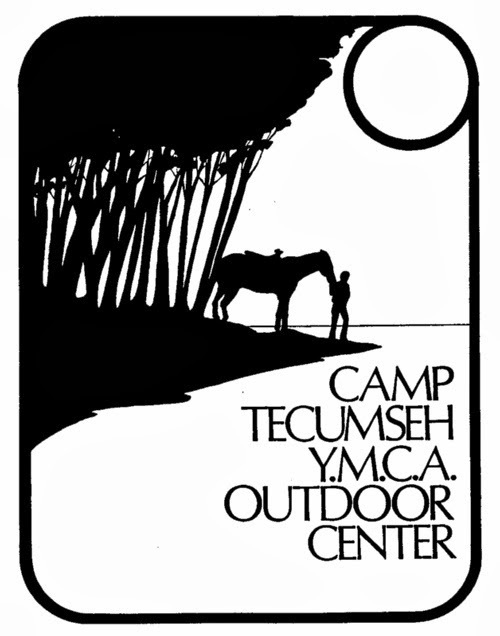 When I was a kid in the late 70's I used to go to Camp Tecumseh for a week each summer, it was this great camp about 45 minutes from my house. I would go for a week, stay in a cabin, sing songs, ride horses, do crafts and make dozens of new friends that I swore I would never forget. We would bring our address books, trade letters for a bit, but after a time you typically stop writing….connectivity broken. I lived only an hour or so from most of the other campers but when you are 10 it might as well be 1,000 miles! Last week I received good news/bad news. I am always happy for a colleague when they have new opportunities and move on, but I MISS them. This friend in particular I will miss. Then off we go! We create google docs, video chats, phone calls and lots and lots of creativity, critical friends and learning. The project gets bigger and bigger, then we edit it back, and keep crafting until we land where we want. I wish for everyone to have someone in their PLN that is this kind of thought partner. The thing is with digital tools, we can keep doing this, I am confident we will still be thought partners and friends and most likely will come up with a way to roll out more projects together! I am so glad I met Sarah through New Tech Network and not at Camp Tecumseh! So I had a big "a-ha" moment yesterday and this post has been rolling around in my head ever since. First you need a little backstory to see how I arrived at the "a-ha"…I am recently divorced after 26 years (nope, not gonna blog about that part!) At the encouragement of a good friend (Thanks, Mary!) I signed up for Match.com just to sort of get my feet wet. After all, I'm ONLY 46 and got married at 19. I could potentially claim to have never actually dated….you don't really "date" in college, right? So many potential blog posts about the whole dating thing, but THAT is not happening…read on…. Being connected is important to me. I am super connected, I connect people via social media as a part of my career. I believe in the power of connectivity, about half of the women who have really walked with me through the past year I only see a couple of times a year, they live in California, Texas, South Carolina, all over the place. I'm totally cool with having long distance friendships…these friends are super digital, we video-chat, we FaceTime, text, IM….we connect online WAY more than in person. I also very much value the amazing group of my friends that I see face to face all the time where I live. So this actually made me start thinking….just how do I define connected? After all, my more local friends are definitely less connected, with a few of them really not technology users at all beyond texting. Why do I not "delete" them? Because they ARE connected. They connect by calling, inviting, learning, loving, listening. They are connected to their parents, their neighbors, their community, their children, their friends. The connect authentically without technology by reaching out. 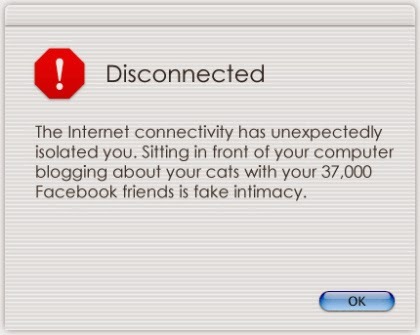 So this made me think of people I know that are connected, but disconnected. People I know that are always on a computer or their cell phone and I'm not sure what color their eyes are, because when you are with them they never look up. People who text a thought or feeling that deserves to be delivered or discussed in person, but texting lets them hide from the emotion you can't help but witness when you are face to face. So my "a-ha", YES, I value being connected, but it isn't the technology at all. When I first begin working in this job, I was overly connected, addicted to a Twitter stream and the myriad of valuable education related chats, this is my 3rd year doing this now. For the past year, I have been working on balance. I'm using my vacation days, I shut down my computer at night, I (usually) leave my phone in my purse at lunch and dinner. I call people more often instead of texting them. I'm certain I have spent time in the last few years, being VERY connected but VERY disconnected. Sitting in the same room with people but my cell phone buzzing w/ tweets so I'm constantly glancing down at it, my iPad right next to me or my laptop slightly open so I don't "miss anything". This reflection also made me think of the judgement we "connected educators" sometimes throw at the educators in our schools who don't use Twitter, don't have an online PLN, BUT they are quick to walk across the hall, chat with others in passing, meet and work on projects. Connecting can be defined more broadly than online. So, I DO value being connected, but it is the people, not the technology…proving once again, no matter what the topic, it always comes down to relationships!